Former Hewlett-Packard CEO Carly Fiorina responded in Wednesday night's Republican presidential debate to the derisive remarks that Donald Trump recently made about her face. "I think women all over this country heard very clearly what Mr. Trump said," Fiorina said without any further elaboration, eliciting cheers from the audience at the Ronald Reagan Presidential Library in Simi Valley, California. In an interview with Rolling Stone published earlier this month, Trump seemingly insulted Fiorina's appearance. Seeing Fiorina on television, Trump reportedly said, "Look at that face! Would anyone vote for that? Can you imagine that, the face of our next president?!" Trump later tried to argue that he was not talking about the businesswoman's appearance but her "persona." After Fiorina's succinct response on the debate stage, Trump added that he thinks Fiorina's "got a beautiful face, and she's a beautiful woman." In a national CBS News poll released this week, Trump is leading among Republican primary voters, though he has slightly more support from men than women. Overall, Trump has 27 percent support, with 30 percent support of male Republican primary voters and 24 percent of women GOP voters. Fiorina and Trump sparred later in the debate about their business records. 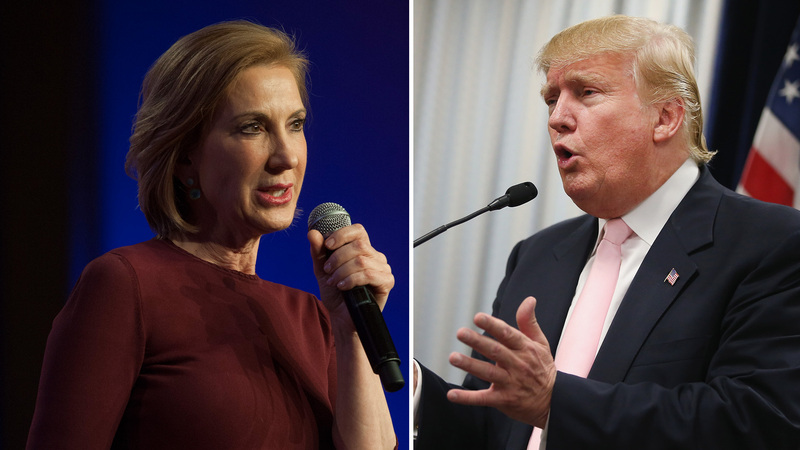 Trump said that Fiorina's business record "is not a positive." Not only was she fired from HP, but "if you look at what happened at Lucent under her tenure it was not a good picture," he said. Fiorina responded to Trump that he was "forced to file for bankruptcy not once, not twice, four times -- why should we trust you to manage the finances of our nation any differently?" After that exchange, New Jersey Gov. Chris Christie scolded his rivals. "You're both successful people, congratulations," he said sarcastically, adding that the average, out-of-work construction worker could "care less" about their success. He told them to "stop this childish back-and-forth."